Andrew Thibeault hit a 2 run walkoff single in the 5th for a Nationals 10-0 playoff win vs. the Pirates. Preston Bois, Zach Jones, Derick Deoleo and Brendon Doughty had hits, Gavin Asimakopulos pitched a complete game 1-hitter. The Pirates got strong pitching from Dominick Coffie. Defensive Battle. Gavin Suchecki (6Ks) held the A’s scoreless through 4. Dylan Klein (8Ks) only gave up 2 runs to the Tigers. Tigers catcher Collin Kochanek threw 2 base stealers out from home. The Tigers offense was led by Josh Tripp (Dbl, 2 Sngl), Cole Warshafsky (Dbl), & Josh Alvarez (2 RBI). The Royals topped the Giants 8-5 behind the stellar pitching of Anthony Marcoux who pitched 4 strong striking out 7. At the plate Devin Hughes had a 2B with an RBI. Cole B, Ryan B, and Logan B all had a hit and an RBI. For the Giants Jayden C. had two hits and an RBI. A big 3rd inning saw 8 Pirates score runs, led by Nicole Gates's 3-run triple. Nicole closed the game out, retiring 9 of 10 to end it. Jomar Sanchez and Jadiel Sanchez each had great running catches. Drew Bushey and Cooper Vaillancourt led the way for the Dodgers, each scoring two runs. Sam Kobs picked up the win on the hill for the A’s. A’s offense was led by Kyle Emmons (2-2, 3 runs scored) and Dylan Klein (1-2, run scored). The Giants last inning rally came up just short and were led by Broden Landsteiner (2-2) and Owen Chickliss (2-3). Dan & Andrew Byrne contributed 2 hits each. Wesley Ortiz was the hero of the game, going 2 for 3 with a bases clearing double and the game-winning hit to cap off a 14-4 victory for the Orioles. Charlie Patterson (3.1 IP, 5K) and Drew Bedard kept the A's at bay on the mound. Jack Ninteau (1 for 2, 2 runs) paced the offense for the A's. A playoff thriller as the Nats beat the Angels 8 to 6. Gavin Asimakopulos was 3-3 and Cam Flanders and Zach Jones had RBI's. Asimakopulos pitched great as the starter and Brayden Ouellet got the save. Taylor Joyal pitched 3 strong and had 3 hits for the Angels. Jacob Munroe also added 2 hits. The Royals topped the Dbacks 10-2 behind solid pitching performances from Anthony Marcoux, Adam Garcia, and Logan Beausoleil. At the plate the Royals were spearheaded by Beausoleil who had a hit and an RBI. Marcoux chipped in with 2hits and the Baez twins each walked and scored a run. The birthday boy, Jack Razz carried the Angels to a victory by striking out 11 and letting up 1 hit. The Angels bats were hot again as they came from behind in the 5th to go up 3. Nick S pitched well for the O's and Charlie Patterson ripped a double in the 3rd to bring in 3 runs. The Angels put up 20 runs on the Dbacks and everyone pitched in. Sam Levine had a few hits with 4 RBIs and shut down the Dbacks in the last inning by striking out the last batter. Jacob Munroe blasted a triple down RF to clear the bases and had 3 hits and totaled 8 RBIs in the game. Nationals battled their way into the AAA championship with a 13-4 win over the Royals. Gavin Asimakopulos and Brayden Ouellet pitched. Cole Patno, Derick Deoleo and Preston Bois had key hits. Logan Beausoleil and Ryan Butler provided the hits for the Royals. 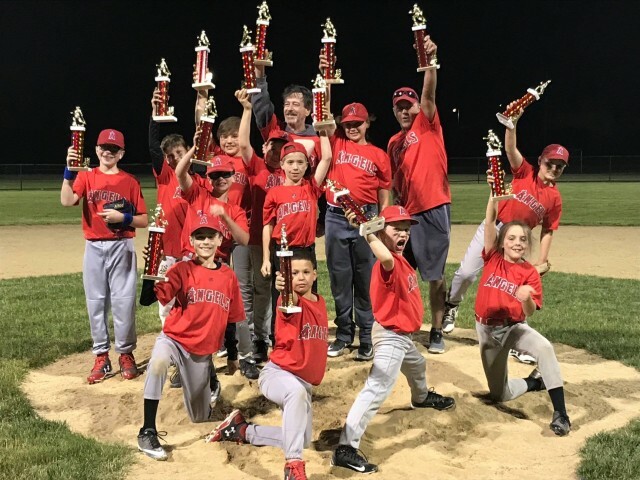 Angels came into championship night needing 2 wins and they got their first by grinding it out for 4 innings and opening it up and the 5th to end it 10-5 and advance to game 2 in a must win. Jack Razz, Taylor Joyal, and Jacob Hutchins kept the Nationals at bay all game. Angels bats were hot! The final game for the title lived up to the hype as the two teams duked it out for 8 innings. Back and forth for 6 innings as the Nationals forced extra in bottom 6. Angels scored 4 in top of 8 and the Nationals did all they could and scored 3 runs with bases loaded for a dramatic Angels victory! Angels are 2018 AAA Champions!